A new hire checklist helps to ensure that you don’t miss any important steps when you add new employees to your team. If you’re adding an employee to your business for the first time, you may be unsure of what’s required. To help you, we’ve provided a free downloadable checklist that includes these important hiring tasks that you can check off as you complete them. If you want to ensure a smooth onboarding process, use an integrated HR management software like Zenefits. Employees can complete 100% of their onboarding online—including signing offer letters, filling out I-9 and W-4 forms, and enrolling in benefits—all before their first day. Zenefits automatically populates this information to its payroll, benefits, and time-tracking tools so your employees can get set up in minutes. Click here for a free trial. Using the 10 checklist steps we’ll describe below, we’ve created this simple template you can download and customize. Use it to ensure you’re prepared for your first employee. If you’re hiring a 1099 contractor instead of a W2 employee, read our article on using an employment contract to hire a contractor instead. 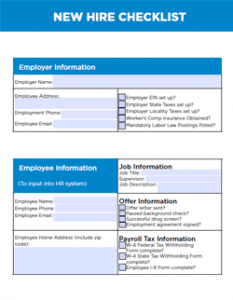 Once you’ve set up your employer identification number (EIN), taxes, and workers compensation’ (steps one through five below), you can modify the template above by omitting most of what’s in the first section since you’ll already have completed those first few steps. The rest of the template can be used for each additional new hire to make sure you don’t miss a critical hiring step. 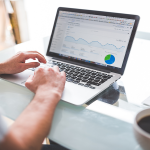 There are five essential things you need to do before you hire your first employee, from obtaining an EIN to setting up taxes and insurance. Then, there are another five tasks like obtaining I-9 forms and other documents that you need to complete with your first and all subsequent new hires. 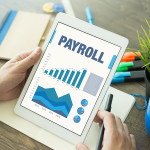 If you have already started that first new employee, you really need to get these done before your first payroll. We’ve documented these 10 tasks into a step-by-step checklist template that you can download and customize. As a final step in our new hire checklist, you’ll also want to designate a safe place to store personnel files. In particular, I-9s and W-4s need to be kept on-hand. We caution against storing paper files in an unsecure location for confidentiality purposes, so we recommend using a secure electronic provider like Zenefits to house all of your employee files. The 10 steps of our new hire checklist with the template above may feel overwhelming for the small business owner who is just beginning to hire staff. However, go through these steps in sequence to ensure you don’t violate any state or federal labor laws. Once the employee is hired, you can move forward with onboarding and training your new employee. Alternatively, consider working with Zenefits to simplify hiring, payroll, and benefits, and onboard new hires online quickly and efficiently. You’ll be supporting your new employees with a great hiring experience in the process. Try it free for 14 days. This is one of the best articles I’ve read as a business owner. And there are links! Thank you! Thanks Shay! You can find a wealth of information on hiring on our website. Using the 10 checklist steps we’ll describe here, we’ve created this simple template you can download and customize. Use it to ensure you’re prepared for your first employee.